From master plans to postage stamp gardens, we will work with you to transform your dream into an outdoor space that you love. You won’t want to go inside! After that meeting, she will prepare a proposal for the development of your landscape. Once accepted, she will return to the site to take measurements, make sketches, and retrieve all the information needed for a sound design. 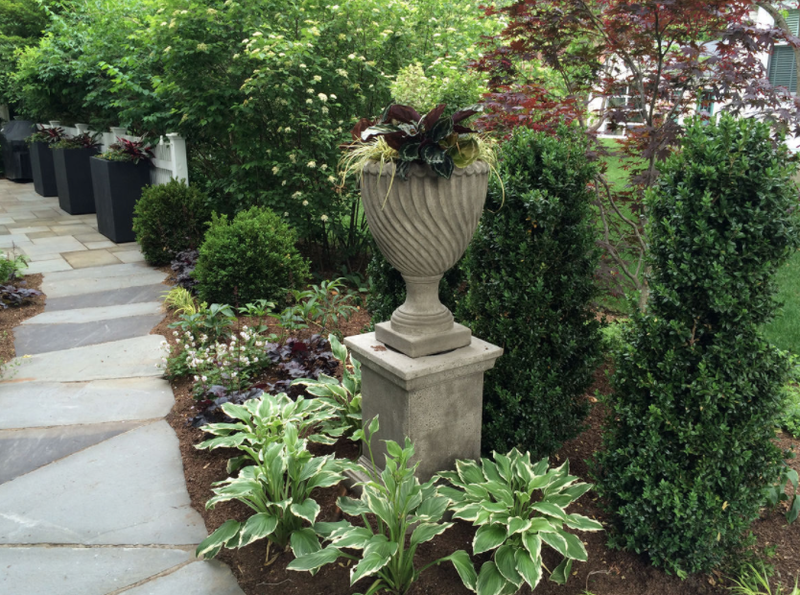 Back in the studio, it’s time to draw up a base plan and develop ideas for hardscaping (such as patios, walls, and walkways), plantings and any other desired elements. Next, you will review the preliminary plan and budget for your proposed garden. After that second meeting, any necessary revisions will be made to the design, on a final plan and plant list. Once your landscape is designed, we work with the best craftspeople and tradespeople to construct the components that go into making a great landscape: patios, walls, walkways, fencing, lighting, irrigation, planters, sculpture…whatever it takes to bring your dream to reality. While the hardscape is being constructed, Darcy is available to oversee the installation. During construction, we are busy selecting the best plants at the nurseries. Once the plants are procured and the hardscape elements installed, the plants are tucked into their new homes, either by our crew, or with a contractor (this depends on the scale of the project). Every detail is attended to to make sure that the final garden is installed as it was designed. Just add water! - or we can install a drip irrigation system for thirsty baby plants. Patios, walls, walkways, fencing, lighting, irrigation, planters, sculpture…whatever it takes to bring your dream to reality. 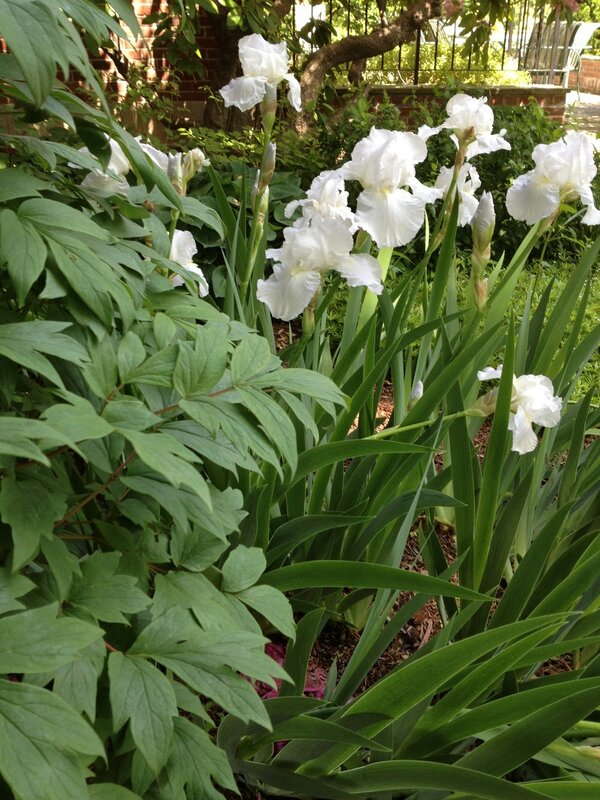 Once the garden is built, our trained horticulturists and gardeners will keep your landscape healthy and beautiful. From the invisible, like caring for the health of your soil, to the all-too-visible daisies that need to be deadheaded, we are on the job! What is organic garden maintenance? By boosting the health of your soil and eliminating chemical fertilizers and pesticides, we strive to provide you with a garden that looks, smells, and sounds (hint: buzzzzz) wonderful. But we have many other strategies too that enhance the diversity and health of your garden: using native plants, considering ways to keep rainfall on your property, encouraging birds and pollinators to visit the garden, or chopping up some of the waste material and putting it back into the garden. While we are thinking of ways to encourage health in your garden, we are also pulling, pruning, and deadheading like happy garden gnomes. We offer a full range of gardening services that we can adapt to your needs and budget, and that will rid your life of weeds and other various naughty garden bits. So, if you love the roses when they bloom, but don’t care for the brown soggy blobs left on them when they are finished, or if the weeds are getting taller than your flowers, perhaps you need a little of our help. We will come to your garden on a set schedule. We’ll take care of all the tasks such as: weeding, pruning, feeding, mulching, and deadheading. You will have an annual fee set according to your budget and needs, and divided into five payments. Our services can also include spring, summer, and fall container flowers , as well as winter/holiday arrangements. We take care of all the hard work, you get to chill and enjoy your beautiful organically maintained garden. Many clients engage us on a ‘time and materials’ basis. This is a good choice for you if you just have an occasional need for a ‘tune up’ or are getting ready for a special occasion and need extra help. You want us to "just do what needs to be done to make it awesome". We will come regularly and adjust our work to the needs of the garden. This gives us the flexibility to expand or contract our work according to what current conditions tell us. Heavy spring rain that pushes new growth one season might require us to spend more time pruning than in other years, while drought might dictate extra mulch or adding surfactants to the soil. Now go and smell the organic roses!